Two -- hand-hewn 1 BR log (Pet Friendly) cabins located at the French Broad River close to downtown Hot Springs. 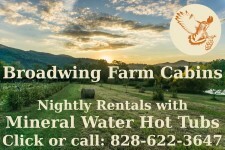 Beautiful country setting that inspires relaxation but situated to base your mountain adventure. The Bear -- 2 BR (queen beds) with futon in LR. Sleeps up to 6 people (No Pets in this one). Check our website for Specials, Photos, Availability and to Book your vacation with us with instant booking.